Using a sharp knife, score the ham in a diamond pattern, making ¼ inch deep slices. Place the ham on it’s side, not faced down in the oven bag set in a large roasting pan. Roll the sides of the bag down so that the bag is open wide and you can get your hands around the ham easily. Combine the brown sugar and Dijon mustard in a small bowl and stir until thoroughly combined. Rub the sugar mixture all over the ham. Stud the ham with about 2 dozen or so whole cloves. Puff up the bang a little by blowing into it and close the bag tightly with the provided twist tie. Make a few small slits with a sharp knife at the top of the bag for ventilation. Do not forget this very important step, or the bag will burst! Move the oven rack just low enough that the bag won’t touch the upper elements of the oven then bake at 350˚F for 2 to 2 ½ hours or until nicely browned and caramelized. Remove the ham from the oven and rest, inside the bag, for about 30 minutes before serving. 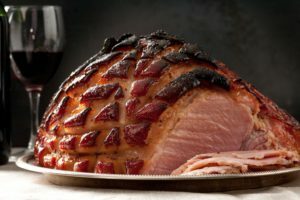 Slice it for your Thanksgiving dinner, dice it up the next morning for some delicious ham and eggs, slice it thinly for ham sandwiches, use the bone in your soups or beans…possibilities are endless!